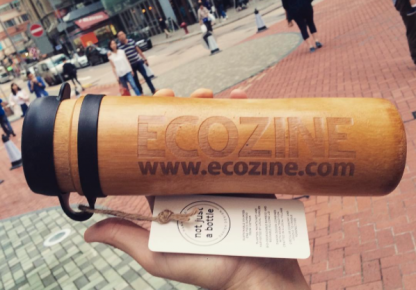 Ecozine's newest partner is the hottest bottle on the block this season - and we have specials for you! Ecozine is proud to be partnering with Not Just A Bottle, and to celebrate, we’re offering a 15% discount on all orders for friends of Ecozine this season — see below for details! Purchase a bottle for yourself or for a loved one, and enjoy a discount on your order until February 28th, 2017. Simply visit the Not Just A Bottle website to place your order, and enter code ECOZINE at checkout to apply an additional 15% discount to the final price on your order. Not Just A Bottle makes a truly impressive and unique corporate gift, event memento, or team bottle. The bamboo can be embossed with any logo or graphic you choose, making a branded product that will last a long time, be used proudly, and give back to the planet. Please email njab@ecozine.com for details on corporate and other bulk orders. All orders will enjoy an additional 15% discount until February 28th, 2017. WHAT IS NOT JUST A BOTTLE? 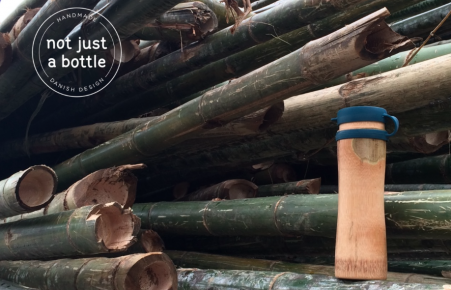 Not Just a Bottle is an innovative young Danish company, founded by Martin Jensen and Frantz Pedersen, that company develops, designs, produces & sells sustainable, handmade one-piece bamboo bottles. The concept embraces the notions of circular economy, cradle-to-cradle & free water solutions, all represented in a bottle that is truly beautiful, unique and practical. 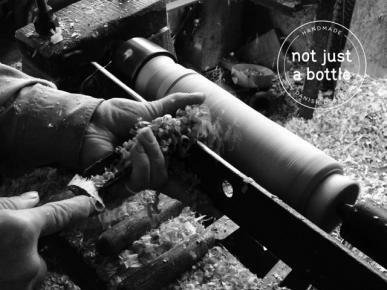 Each Not Just A Bottle is handmade of a single piece of sustainably sourced bamboo. 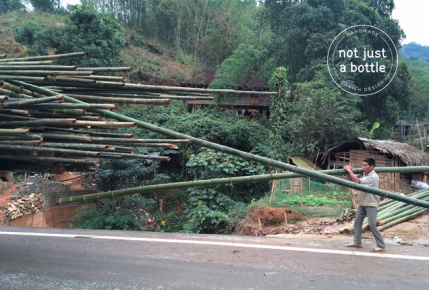 The bamboo is sourced from bamboo forest communities in Vietnam, where 3,000 families maintain and harvest the bamboo. Bamboo is one of the fastest growing types of grass and can grow up to 30 meters with a 12 cm diameter. It is normally harvested after 3-5 years, which binds CO2 much faster than slow growing trees. The bottle is then hand drilled and hand polished in local villages in Vietnam. The villages ranges from 20 to 600 families, and each family has specialised for generations in handcrafting wooden and bamboo products. The craftsmanship of each bottle means that none are identical. They differ in height/diameter, look and weight, and some have large grain patterns, others have less. These differences make each bottle authentic and unique, and each Not Just a Bottle holder will quickly find the pattern or grain that makes their bottle recognisable. In addition to being made from bamboo, the bottles are coated in an all-natural, food-grade coating and comes with a food safe 200 degrees Celcius liquid resist silicone inlay, which is ideal for hot or cold water, tea, coffee, etc. The inlay also keeps liquids cold and warm for hours. Even the packaging has been considered; bottles come with minimal packaging (small labels), also made from sustainably sourced bamboo fibres and made locally in Hong Kong by old Heidelberg pressing machines that were used to press Hong Kong’s local newspapers in the 1970's. In its efforts to close the loop and be a sustainable producer, Not Just A Bottle partners closely with the local government in Vietnam, the Cradle to Cradle Products Innovation Institute, and is also working with the Forest Stewardship Council® to obtain FSC certification.